What gives me hope is knowing there is a God who is watching over me on a daily basis. To go even farther, I would say He watches over me on an hourly basis. Hope. Hope is who holds my hand. I was diagnosed with chronic kidney disease (CKD) when I was just reaching my young adult peak. I had been married a few years with two small children. I was attending college on my way toward a BA degree in Psychology. My passion is to help the deaf and hard of hearing community with social issues. I was doing my thing. Hope. Hope encourages me to soar. Then my life changed suddenly. I needed emergency dialysis. Yes, a year prior, I was told by my nephrologist, whom I respected, that, eventually, I would have to go on dialysis. The mere idea of this happening to me never sank into my brain. I thought what he was telling me was never going to occur. When I was rushed from the doctor’s office straight to the hospital, I knew then I was in big trouble. Hope. Hope hid me. Decisions needed to be made for the long term, and I had to be the one to make them. What method of dialysis should I choose and which permanent access would best work for me? Hope. Hope held me up. My nephrologist, Paul Crawford, MD, took such good care of me because he knew I was afraid. He walked me through this very strange situation that was going on within me. Hope. Hope saw me through. After my first in-hospital treatment, per Dr. Crawford’s orders, a television set with VCR was wheeled into my room. The nurse handed me several videotapes explaining each type of dialysis treatment and its delivery methods. I began to view the tapes and educate myself about my illness. I wanted to learn as much as possible as quickly as possible. I realized I had to make some serious decisions without a lot of time to do it. Hope. Hope opened the door. Dr. Crawford sat down and talked over my decisions with me. Since I had two small children school aged, peritoneal dialysis would be best. I agreed. Hope. Hope brings comfort. The span of my life with CKD is 19 years and counting. I share my story about my first encounter with kidney patients everywhere I go. I believe we share the same experiences and can relate to one another. Hope. Hope is our connection. It took me five years to accept what had happened to me. I was in denial. I just knew I would wake up from this dream and everything would be back to normal. My children were a big help and support for me. My son, Antione, would ask me everyday when I would return home from hemodialysis: “How was your day?” He was only seven years old at that time. The sound of his voice when he said this brought comfort and joy to me. Chanel, my daughter, was eight years old, and she thought I was saying my “kitties” are not working anymore. She would say: “Can we go get you another kitty?” Children are so precious at that age. They are 22 and 23 years old now with children of their own. Hope. 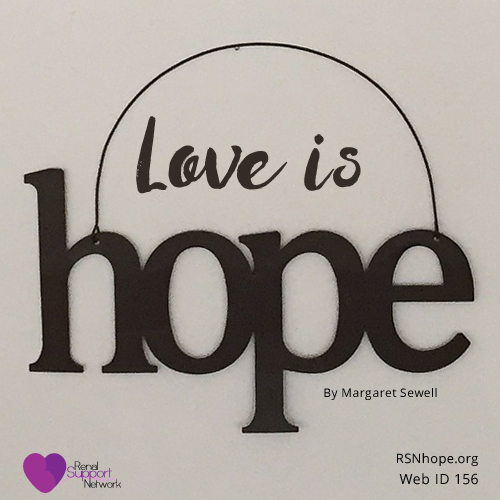 Hope is love. My marriage did not survive my illness. We were not strong enough as a couple to patiently wait for the good times to roll back around. A chronic illness can be stressful for the whole family. I was mainly concerned that my children were fine with me being ill. I did not want them to go without the love and support of their mother. I was an active school parent before my diagnosis, and I did not want that to stop. I have done peritoneal dialysis and hemodialysis until I received a successful transplant in January 2005. Instead of having dialysis treatments, I am able to sleep in more, and I have gone back to college. Exercising is my new hobby because I have more energy. The same year of my transplant, I became a grandmother of two handsome boys. Earlier in my illness, with my many ups and downs, I would not have been here to see them. Hope. Hope is the future. I encourage everyone diagnosed with any illness to actively get involved with his or her healthcare. The more you know, the better quality of life you can have. How well do you want to live? Ask questions. Search the web. Talk to other patients, and keep an open mind. Your life is what you make it. Hope. Hope is what I live for. Margaret Sewell lives in Harvey, IL.